Today, Cisco announced the expansion of their MDS storage networking portfolio with the addition of three new products. These new products bring increased performance, automation, and ease-of-use to an already great product line. I’ll walk through the new offerings below. The 9148S is a 1U 48-port 16Gbps FC switch. The ports can run full 16Gb or step down to 8, 4, or 2Gb as needed. The switch can be licensed for the full 48 ports, or in 12-port increments, allowing customers to pay as they grow. 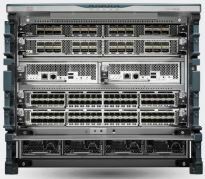 The 9148S features automated provisioning, non-disruptive upgrades, and Cisco’s hardware-based congestion control. It supports up to 32 Virtual SANs (VSANs), Inter-VSAN Routing (IVR), QoS, PortChannels, N-Port ID Virtualization (NPIV), and N-Port Virtualization (NPV). The MDS 9706 is a 9U director capable of scaling up to 192 line-rate ports. Those ports can be 16Gb FC, 10Gb FCoE, or a mix of the two. Customers build out the director using 48-port Cisco MDS line cards. The MDS 9706 brings all the features of Cisco’s MDS 9710 to a smaller form-factor and offers 15X the performance of the Cisco MDS 9506. If you’re anything like me, you just started doing some math in your head or you reached for the calculator app on your phone. Let me do the math for you. Each slot can can have a 48-port line-speed card. If that’s a 10Gb FCoE card, the slot will need a maximum of 480Gbps switching capacity. For a 16Gb FC card, the slot would need a maximum of 786Gb switching capacity. While the math would seem to indicate that this director is built with some serious overkill, I actually think it’s one of the best features of its architecture. When customers purchase a director of this size, it’s really a long-term investment in their data center’s infrastructure. By building in the extra switching capacity, Cisco is helping customers to protect their investments. When newer, faster networking technologies come out (say, for example, 40Gb FCoE), customers will be able to add new line cards without needing to upgrade the director. This card fits MDS directors like the new MDS 9706. It’s a 48-port FCoE card capable of supporting all ports at a full 10Gbps line-rate. FC networks can have performance issues known a “slow-drain”. This occurs when a misbehaving device slows the receipt of packets destined to it. This can affect unrelated devices and workflows. Slow-drain can be caused by a number of things, including speed mismatches, HBA issues, server/OS/application performance issues, or even a non-graceful exit of a virtual machine. Cisco MDS devices have the ability to detect these issues and take automated corrective actions. The MDS 9500 and MDS 9148 have a software-based congestion control mechanism. This can take up to 100ms to detect a problem and up to 100ms to take action. The hardware-based congestion control in the MDS 9706, MDS 9250i, and MDS 9148S is capable of detecting problems within 1ms and can take immediate corrective actions. This is a huge step up from previous congestion control. Meeting the cloud-scale needs of customers requires automation. In support of that, Cisco MDS allows for FC zoning automation. That automation offers integration with some of the industry-leading automation platforms out there, allowing customers choice and ease of use. The new products will be available this quarter. This entry was posted in Cisco and tagged Announcement, Cisco, MDS, Network. Bookmark the permalink.